As evil spreads across Gotham City, Batman's allies, including Red Robin, Batwing, Robin, Batgirl, the Birds of Prey, Nightwing, and even Catwoman find themselves in a battle coming from all sides. 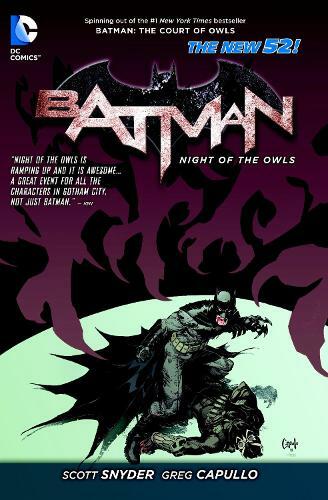 The Court of Owls have shown their hand, and it's up to the collective effort of these heroes, some more unlikely than others, in this sprawling tale of corruption and violence. This epic springs from the pen of Scott Snyder, New York Times bestselling author of Batman: The Black Mirror and American Vampire, as well as creators Judd Winick, David Finch, Peter J. Tomasi, Pat Gleason, Tony Daniel, Scott Lobdell, Duane Swierczynski, JH Williams III, Jimmy Palmiotti, and Justin Gray!This volume collects the following issues: Batman #8-11, Nightwing #8-9, All-Star Western #9, Catwoman #9, Batgirl #9, Batman: Dark Knight #9, Batman and Robin #9, Birds of Prey #9, and Red Hood and the Outlaws #9.